PARIS—If the World Cup had given the impression that Lionel Messi was slipping down soccer’s pecking order, the Argentine star made it clear he remains at the top of his game. 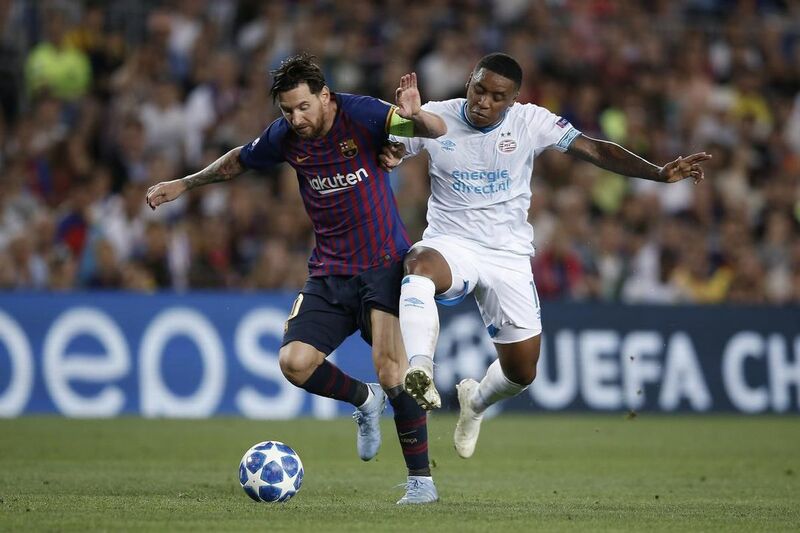 Messi scored a record eighth Champions League hat trick on Tuesday in Barcelona’s 4-0 win over PSV Eindhoven as Europe’s top club competition got underway. Meanwhile, Kylian Mbappe, the teenage star widely viewed as the man capable of dethroning Messi and Cristiano Ronaldo in a near future as the best player in the world, endured a frustrating night in a 3-2 loss with Paris Saint-Germain at Liverpool. The World Cup winner scored a second-half equalizer but then gave the ball away in stoppage time, a costly mistake that paved the way for Roberto Firmino’s winner. Messi once again failed in his bid to lift the World Cup trophy this summer in Russia, where he did not play at his best and Argentina lost to France in the round of 16. But Messi is a different player in the Champions League, a competition he has won four times and in which he has scored 103 goals. With his hat trick on Tuesday, he now leads Ronaldo 63-60 in total group-stage goals. “We were up against Messi, the best in the world,” PSV coach Mark van Bommel said. Ousmane Dembele also scored for Barcelona, which was already 3-0 up when it was reduced to 10 men as defender Samuel Umtiti was sent off with a second yellow card for a hard foul in the 79th. The Group B result extended Barcelona’s unbeaten run at home to 27 matches in the Champions League. In the group’s other match, Mauro Icardi volleyed in a superb equalizer for Inter against Tottenham and Matias Vecino headed in the winner in injury time to complete a 2-1 win for the Italian club on its return to Europe’s top competition. LIVERPOOL PREVAILS: At Anfield, Mbappe scored his 11th Champions League goal since he made his debut in the tournament during the 2016-17 season. His mistake in stoppage time proved costly for his club, though. After netting PSG’s equalizer in the 83rd minute, Mbappe was dispossessed by James Milner in the closing stages of the match, giving Liverpool a chance to mount a final attack. Firmino collected a pass from Virgil van Dijk and fired a low shot into the far corner to seal the Reds’ victory. PSG was down 2-0 after 36 minutes following goals from Daniel Sturridge and Milner but managed to fight back as Thomas Meunier pulled one back before Mbappe levelled. PSG, whose main goal this season is to win the Champions League after repeated failures, next plays Red Star Belgrade, which drew 0-0 with Napoli. A year after making it to the final, Liverpool showed it might be capable of challenging for the title once again by finding a way to tame Neymar and Mbappe for much of the game. PULISIC SCORES: Christian Pulisic celebrated his 20th birthday by scoring on his return from injury to give Borussia Dortmund a late 1-0 win at Club Brugge in Group A. “It was great to come back after injury to and to be back with the team,” said Pulisic, who made his 100th appearance for the club. The American, who hadn’t played since Aug. 26 due to muscular problems, came on with around 20 minutes remaining and scored in the 85th when Matej Mitrovic’s attempted clearance rebounded off his shin and looped in over Brugge goalkeeper Karlo Letica. “It was a bit lucky but I’ll take it on my birthday,” said Pulisic, who had missed two Bundesliga games for Dortmund and the U.S. friendlies against Brazil and Mexico. MONACO LOSES, AGAIN: In the other Group A game, Monaco was handed yet another home defeat, losing 2-1 to Atletico Madrid. After losing all three home games in the group stage last season, Leonardo Jardim’s side grabbed an early lead against the run of the play with a goal from Champions League debutant Samuel Grandsir. However, Atletico dominated for long spells and struck back before the interval through goals from Diego Costa and Jose Gimenez. ETERNAL CASILLAS: Schalke goalkeeper Ralf Faehrmann saved one penalty but was beaten by another as Porto salvaged a 1-1 draw in their Champions League-opening game on Tuesday. Galatasaray defeated Lokomotiv Moscow 3-0 at home in the other Group D game. In Germany, Porto keeper Iker Casillas started his 20th Champions League campaign, more than any other player.